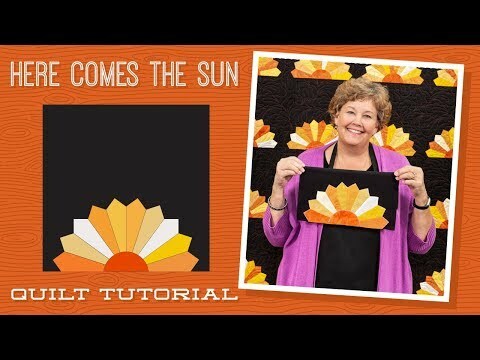 Digital Download - Here Comes the Sun Quilt Pattern by Missouri Star - Missouri Star Quilt Co. - Missouri Star Quilt Co. There's few things quite as beautiful as a bright and colorful sunrise! This Dresden-inspired quilt pattern is sure to give you a sunny disposition as the sunburst designs peek over the edges of the blocks. With 1 package of 10" squares, 5 1/2 yards of background fabric, and 1/2 yard of complementing fabric, you'll be ready to face the morning, and this quilt, head on. Finished size: 81" x 94 1/2"